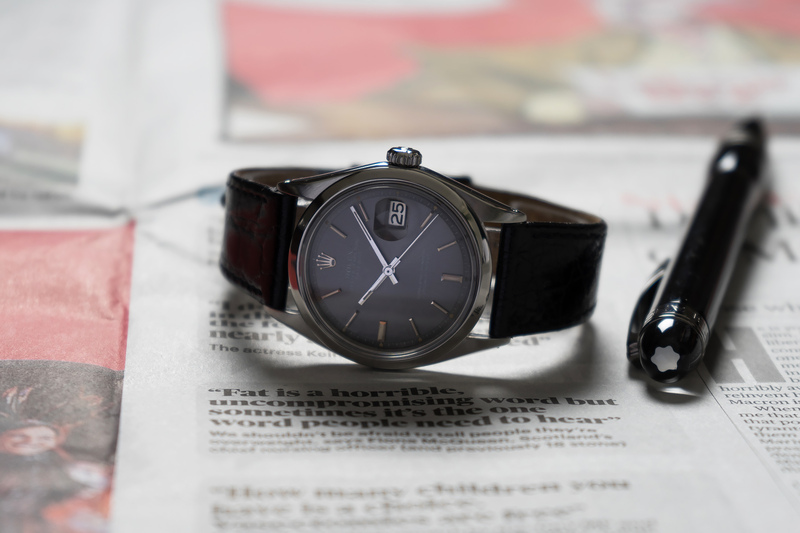 The Vintage Datejust is probably one of the most recognizable and coolest Rolex watches in the world! There’s something about the size, the case and its fluted or engine turned bezel combined with the Jubilee bracelet that triggers the (watchnerd) mind into recognizing that hey, that’s a vintage Datejust! 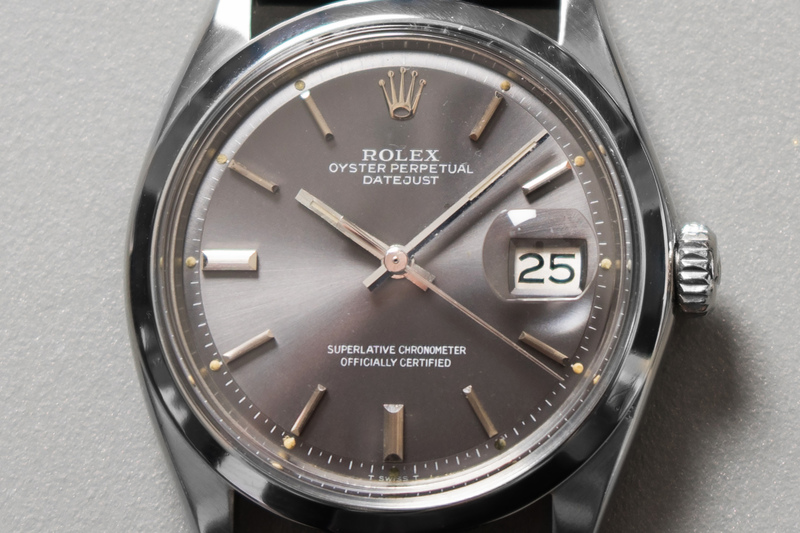 However, that might not always be the case with a reference 1600 Datejust. This reference has a smooth and slightly domed bezel making the Datejust look completely different, it even looks a little bigger – but thats just optical ofcourse. The case diameter on all 1600’s still measures 36mm, still that small detail of a different bezel gives you an entirely different Datejust, it’s like a small Milgauss or something – really cool! 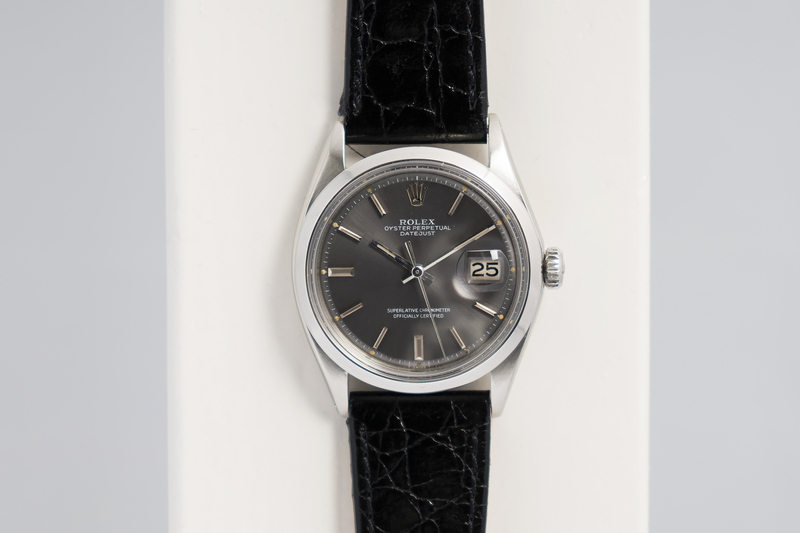 The 1600 Datejust can be found with an Oyster or Jubilee bracelet but the one we are offering here came to us without its steel bracelet and so we fitted the watch with a black leather strap to nicely match the dial. 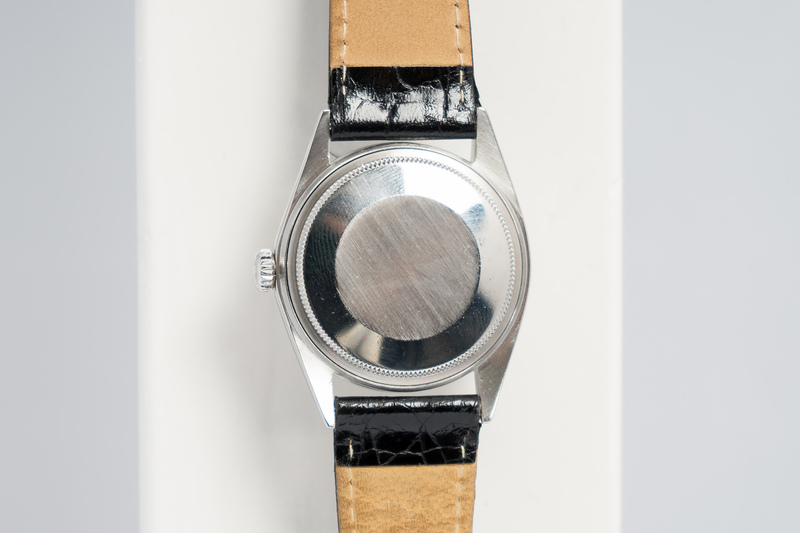 About that dial – The stunning slate grey pie-pan dial is out of this world and a rare beauty! Most 1600 Datejust watches out there are fitted with black or silver dials, so this slate grey dial with white printing is really something else! Also, did you notice the wonderful creamy Tritium plots at the end of the hourmarkers? – exactly how we love ‘m! The true color of this pie-pan dial is hard to capture in an image, you just really need to see this one with your own two eyes! 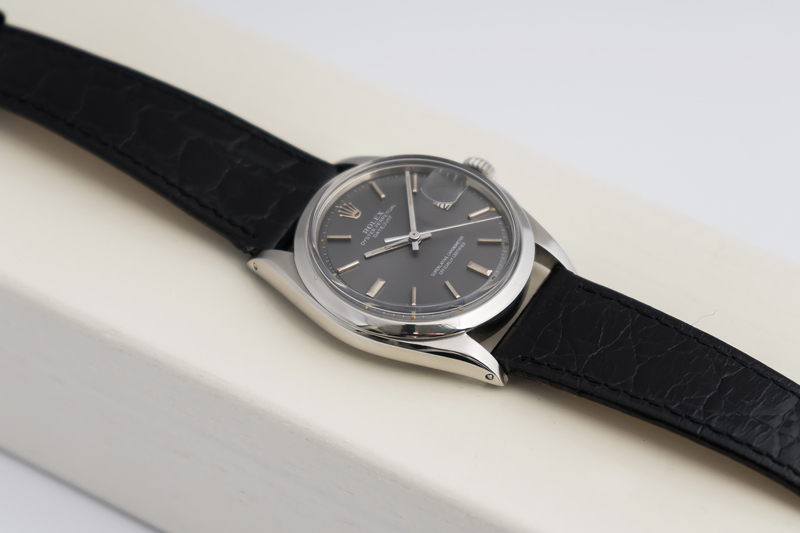 At the moment of writing this, there were 105 Vintage Datejust watches with a 1600 reference for sale on Chrono24, as opposed to 1215 Datejust watches with a 1601 reference! 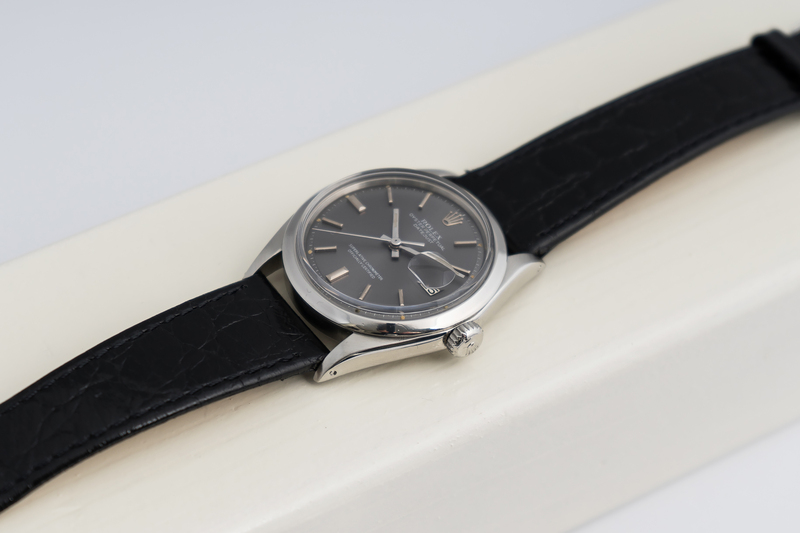 (just to give you an idea about the rareness of a 1600 reference) Out of those 105 watches not one had the color dial we are offering you here – Get it while you can! This is a rare beauty!